This is a simple and classic Sterling Silver 925 English Name Necklace, personalized specially for you (see other listings for other types of writing and Hebrew names. A 5 mm pearl hangs from the middle of the name - while the pendant is suspended from a box chain. It would make a perfect birthday, or Christmas Present. 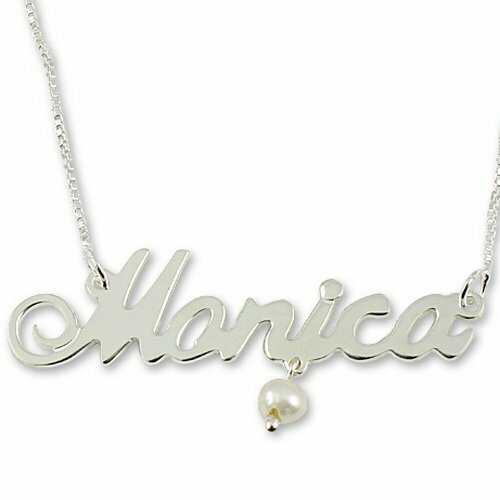 What girl will fail to treasure this adorable personalized necklace? It comes with a Box Chain (this is the default if you do not state a choice) as in the picture of the name Julia or a Rollo chain (as in the picture of the name Natalie) and in a choice of lengths. The chain length does not include the pendant - which is attached at either side of the name. These will be made to order especially for you, and in general will be shipped out in around a week or often much less. If you are in a rush please let me know.